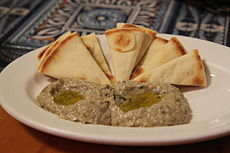 ^ “Baba ghanoush”. Merriam-Webster Dictionary. https://www.merriam-webster.com/dictionary/baba%20ghanoush. 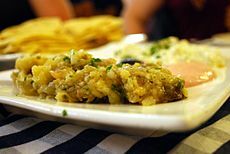 ^ “Baba ganoush”. Oxfort English Dictionary. https://en.oxforddictionaries.com/definition/baba_ganoush. ^ a b c d Gil Marks (2010). “Baba Ghanouj”. Encyclopedia of Jewish Food. Houghton Mifflin Harcourt. https://books.google.de/books?id=gFK_yx7Ps7cC&pg=PT138. ^ a b c d Salloum, Habeeb (2012-02-28) (英語). The Arabian Nights Cookbook: From Lamb Kebabs to Baba Ghanouj, Delicious Homestyle Arabian Cooking. Tuttle Publishing. p. 34. ISBN 9781462905249. https://books.google.com.sg/books?id=v5TTAgAAQBAJ&printsec=frontcover&source=gbs_ge_summary_r&cad=0#v=onepage&q&f=false. ^ Marks, Gil (2010-11-17) (英語). Encyclopedia of Jewish Food. Houghton Mifflin Harcourt. ISBN 0544186311. https://books.google.nl/books?id=gFK_yx7Ps7cC&pg=PT138&dq=origin+baba+ghanouj&hl=nl&sa=X&ved=0ahUKEwi246eS45bbAhVObVAKHYY6ATgQ6AEIJzAA#v=onepage&q=origin%20baba%20ghanouj&f=false. ^ Nicolas Trépanier (30 November 2014). Foodways and Daily Life in Medieval Anatolia: A New Social History. University of Texas Press. pp. 129–. ISBN 978-0-292-75929-9. https://books.google.com/books?id=ciXNBAAAQBAJ&pg=PA129. ^ Levy, Faye (2003). Feast from the Mideast: 250 Sun-Drenched Dishes from the Lands of the Bible. HarperCollins. ISBN 0060093617. ^ Marianthi Milona; Werner Stapelfeldt (2004). Culinaria Greece: Greek Specialties. Könemann. ISBN 3833110538. ^ Rena Salaman; Jan Cutler (2006). The Complete Book of Greek Cooking. Hermes House. ISBN 1844777707. ^ ひとり歩きの会話集　ギリシア語. JTBパブリッシング. (2010). p. 8. ISBN 4533115675. https://books.google.com.sg/books?id=MPYyDQAAQBAJ&printsec=frontcover&source=gbs_ge_summary_r&cad=0#v=onepage&q&f=false 2018年11月18日閲覧。. David, Elizabeth (1950). Elizabeth David#Books. Alfred A. Knopf. ISBN 0-394-49153-X. Trépanier, Nicolas (30 November 2014). Foodways and Daily Life in Medieval Anatolia: A New Social History. University of Texas Press. ISBN 978-0-292-75929-9. https://books.google.com/books?id=ciXNBAAAQBAJ&pg=PA129.